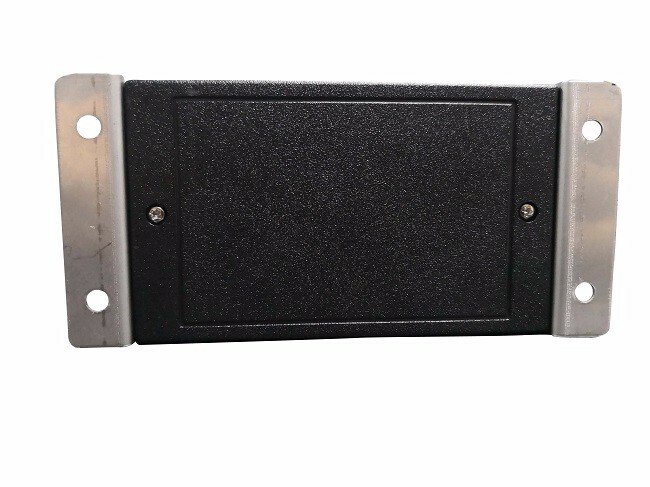 Constant Monitor 001-9201 uses a solid state impedance design to constantly test the connection integrity of the entire ground system including the person, the wristband and the coiled cord. Constant Monitors 001-9202 and 001-9203 also provide worksurface monitoring. This system is fully automatic and activates when a wrist strap is plugged into the unit. A green light indicates connection and a red light indicates there is no connection (disconnected status). The unit is powered and grounded by the AC adapter. • Monitors can check up to two wrist strap systems and one work surface, depending on the model. • Compatible with single-wire wrist straps. • Easy to use: Simply plug in the wrist strap. • Easy to install: Attach the monitor boxes to the bench with included hardware, connect the mat and plug it in. Damage to electronic devices is caused by static electricity from people. Connecting people to ground directs static electricity away from devices. 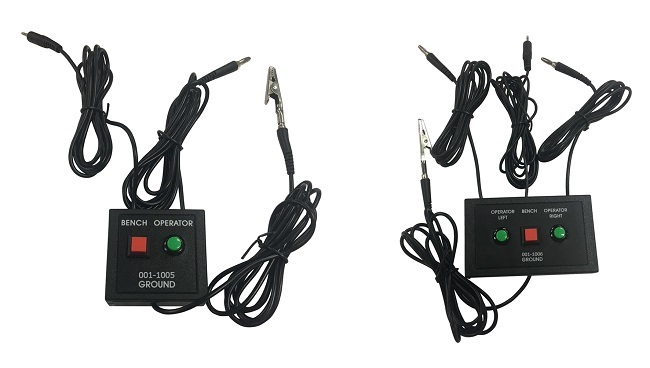 Constant Monitors are designed to constantly test the connection of the person, the wristband and the coiled cord to help ensure that people remain grounded. 1. Check that you have received all parts: monitor, power ground adapter and two mounting screws. 3. Plug the power/ground adapter into the back of the monitor and into a 3-prong 120VAC outlet. 1. Check that you have received all parts: monitor, power/ground adapter and two mounting screws. 1. Check that you have received all parts: monitor, remotes, four screws, power/ground adapter, mat cord and industrial hook and loop. 2.Using the hook and loop, mount the monitor under the workbench shelf. 3.Mount the remotes to the work bench with screws. 4.Connect the monitor to the mat with Conical Head Straight Earth Lead. 6.Plug the power/ground adapter into the back of the monitor and into a power outlet. 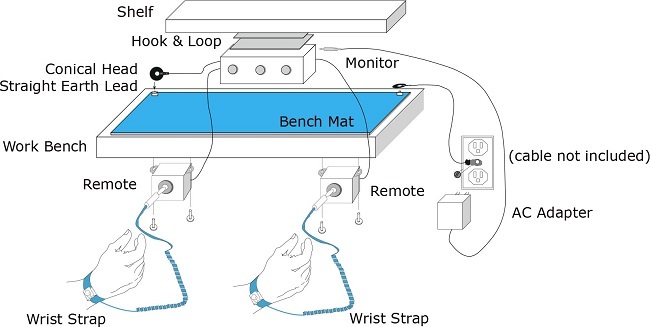 Note: The mat connection monitoring function can be connected to a workbench with a hard worksurface. 1. Place a wristband on your wrist and plug the coiled cord banana plug into the monitor’s banana jack. The monitor will display a green light when a functional wrist strap with good skin contact is connected to the unit. 2. The unit will sound an alarm and display a red light if the wrist strap becomes defective or if the person is not in contact with the wristband. 3. Unplug the wrist strap coiled cord from the unit to stop the alarm. 4. Monitor will alarm if the continuity from the monitor to the mat to ground is lost. The Constant Monitors are calibrated to standards traceable to NIST. Frequency of re-calibratrion should be based on the critical nature of those ESD sensitive items handled and the risk of failure for the ESD protective equipment and materials. In general, ESDMAN recommend that calibration be performed annually. 001-9201 0.9" H x 1.8" W x 1.3" D 1.2 oz. 001-9202 1.0" H x 2.4" W x 2.3" D 1.6 oz. 001-9203 1.0" H x 4.0" W x 2.4" D 2.6 oz. Read, understand, and follow all safety information contained in these instructions prior to the use of Constant Monitors 001-9201, 001-9202, and 001-9203. Retain these instructions for future reference. • Do not use in an explosive environment - monitor is not designed to be intrinsically safe. • Persons with heart pacemaker devices should never use this monitor. • Use only the power supply provided by ESDMAN and specified for the country of use. • Do not position the monitor accessories or other equipment where unplugging the power supply is difficult. • Always locate the power source (socket or outlet) near the equipment. The power supply plug serves as the disconnect device. • Do not modify or attempt to service the power supply or monitor; there are no user serviceable parts. • Replace power supply if damaged using only ESDMAN supplied parts. • Do not use the Constant Monitors 001-9201, 001-9202, 001-9203 or their power supplies outdoors in wet/humid environments. • Do not use the Constant Monitors 001-9201,001-9202, 001-9203 or their power supplies outside of the operating conditions listed in this guide. • Always follow instructions for installation as stated in this user guide. Dispose of this monitor in accordance with all applicable local and government regulations. 1. Monitor must be checked periodically to verify each test mode is functioning correctly. 2. Ensure proper operation of monitor by performing operational verification test as required. 3. Ensure tester is properly grounded.